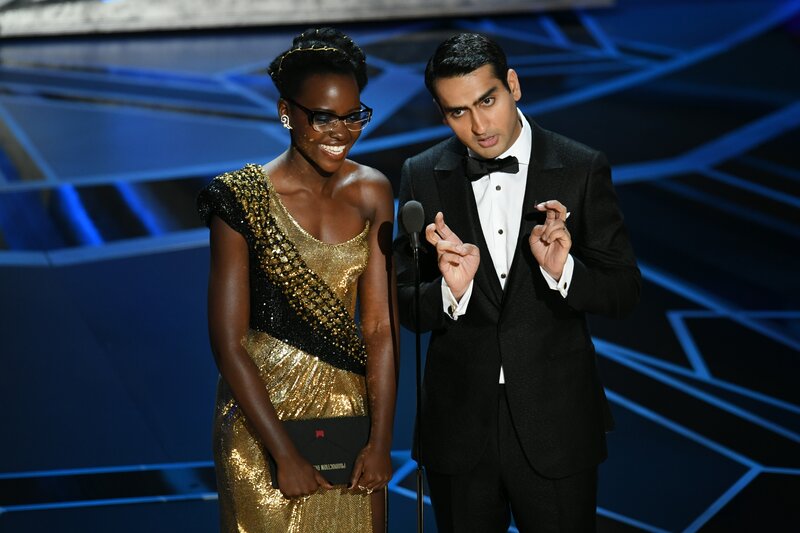 Presenting the Oscar for Best Production Design, the actors related their own experience as immigrants to that of undocumented immigrants hoping to stay in the U.S.
Before presenting the award for Best Production Design, Kumail Nanjiani and Lupita Nyong’o took a moment to express their support for “Dreamers,” undocumented immigrants brought to the United States as children who have largely known no other country. The pair began with a nod to their own immigrant experiences — Nyong’o, who won the Best Supporting Actress Oscar in 2014 is from Kenya and Nanjiani, nominated this year for Best Original Screenplay is “from Pakistan and Iowa, two places that nobody from Hollywood can find on a map.” They then drew a connection between the entertainment industry, the American Dream, and Dreamers metaphorical and literal. “Like everyone in this room and everyone watching at home, we are dreamers. We grew up dreaming of one day working in the movies. Dreams are the foundation of Hollywood. And Dreams are the foundation of America,” Nyong’o said. More than 800,000 undocumented immigrants brought to the U.S. as children are attempting to remain in the country through the Deferred Action for Childhood Arrivals, a policy established by President Obama in 2012. The Trump Administration opposes the policy and the issue is currently the subject of ongoing court battles between his administration and the states of New York and California. it was also a key disagreement leading to the 2018 government shutdown. 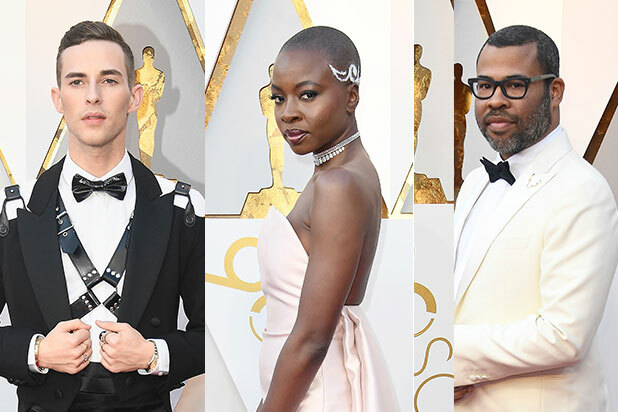 Forget clip-on ties and tasteful brooches -- these guests at the 90th Academy Awards brought extravagant fanfare to their red carpet accessories, and we love them for it. Adam Rippon upgraded his black tux with a leather harness and shoulder cutouts. Straight from her role as Okoye in "Black Panther," Danai Gurira flashed some beautiful hair art on the red carpet. Jordan Peele donned an antlers pin covered in blood -- a reference to one of the gruesome deaths in his nominated film "Get Out." The pin was a custom Jason of Beverly Hills lapel pin, designed by Peele's stylists, Sydney Lopez and Chris Horan, and Jason Arasheben, CEO of Jason of Beverly Hills. Rita Moreno took part of the dress she wore to the 1962 Oscars, where she won for her role in "West Side Story," and matched it with a major statement necklace and a head wrap. Brilliant. Look closer at James Ivory's tux: He's wearing Timothée Chalamet's face. Tiffany Haddish told red carpet hosts that she wanted to honor her late father and her fellow Eritreans by wearing an authentic princess dress from the country. "Call Me by Your Name" director Luca Guadagnino wore a spider brooch on the red carpet. The "Loving Vincent" filmmakers wore hand-painted shoes from the Van Gogh Museum on the red carpet. Common sported a tuxedo with velvet lapel and a pin in the shape of a key. Singer/songwriter Andra Day stuck multiple flower bobby pins, which went AWOL at on point, in her updo on the red carpet.